Is It Possible to Terminate Traffic in Turkmenistan? Like many countries of the former Soviet Union, Turkmenistan is of great interest for beginners. There is no competition and huge earnings are possible with the right approach. 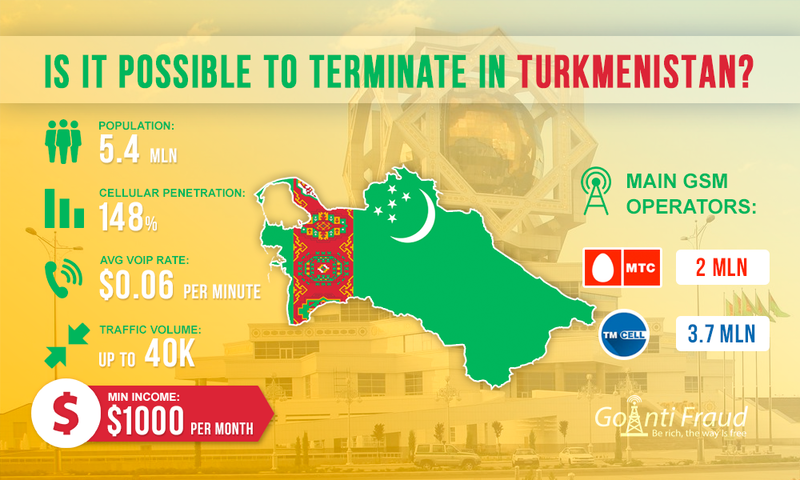 Turkmenistan is a post-Soviet country where there are pitfalls on the path to profit from VoIP termination. According to many migrants, there is nostalgia for the Soviet Union in Turkmenistan everywhere. Novice terminators should take into account that the country's authorities strictly control foreigners, including their movement, residence, time and much more, with clearly regulated not only the purpose of tourist travel but an exact route without any deviations. Law of Turkmenistan requires tourists stay at night at the hotel and arrive no later than 10.00 p.m. The slightest deviation from the rules is punished with fines and deportation. Such provisions make termination rather unprofitable. But using SIM bank and SIM server lets you to manage a GOIP 16 gateway remotely from any place in the world. Another barrier to a successful termination is total censorship of the media and the Internet. According to many tourists, access to the World Wide Web in Turkmenistan is problematic because of the authorities' control. Many sites are prohibited, residents hardly know what YouTube, Facebook, and Twitter are. In some regions there is little Internet speed downloading. According to recent UN data, only 5% of 5,477,176 population of Turkmenistan, are Internet users. But even despite all these conditions, VoIP termination in Turkmenistan is possible because the GSM-connection is available to everyone. 2 GSM operators handle the mobile market. They are "MTS-Turkmenistan” (Barash Communication Technologies INC) and “TM CELL” (Altyn Asyr). "MTS-Turkmenistan" has about 2 million users in Turkmenistan, with over 90% of the country covered. But despite the popularity of MTS, most users prefer the "Altyn Asyr" because of more affordable prices and service conditions. The base of this operator has 3.7 million subscribers. Since the originators provide not huge volumes of traffic - from 10K to 40K, terminators can be connected to any of these operators, by installing your GoIP 16 in the regions with good quality of the Internet. The average price per minute of local call will be $0.018. Originators pay up to $ 0.0896 per minute for landing of GSM traffic. With an average load termination, revenue generally ranges from $1,000 via one VoIP-device channel.